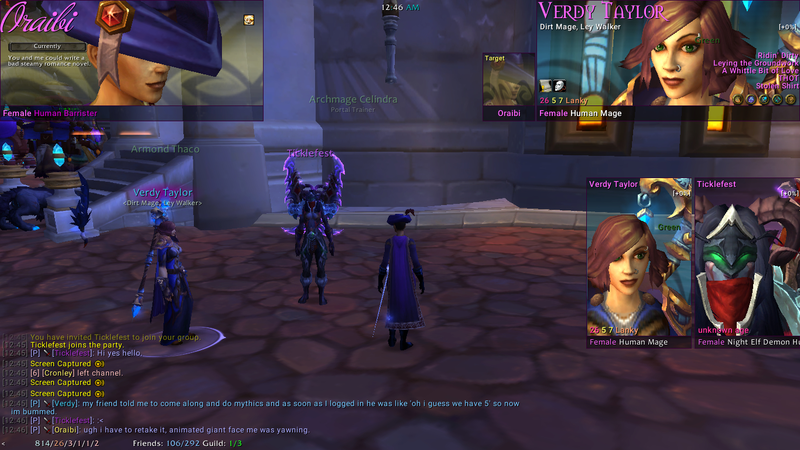 The [rp:tags] addon is a bridge between TotalRP3, a Mary Sue Protocol client, and ElvUI. You need to have TRP3 installed in order to use this. Configuration is via TRP3. If you want to chat about the addon, drop by the [rp:tags] Discord. For a brief tutorial, see the Moon Guard wikia. Updated for 8.1, changed a little about how wrapping and field size for glances work. Fixed a bug related to updating frames when in a party or raid. Fixed a bug where [rp:color] was actually displaying [rp:eyecolor]. Some bug fixes, plus added pronoun tags. See /rptags pronouns for details. Fixed a bug from yesterday's update that was causing the game to freeze for part of a second while updating unit frames. Also a bonus in-game "user manual" for people with trp3 Extended. Labels! For most tags, you can add a -label flag onto it. 1. It puts a label, like "Age: " in front of the tag value. 2. It puts a newline after the tag value. 3. If the unit doesn't have the field to display, it puts nothing. Better control over field display sizes! Use the sliders to set how big you want your fields to be, in characters, from 5 to 60. Or you can give a limit of 0 which means no limits at all. [rp:years-old] -- "30 years old"
[rp:years-ago] -- "30 years ago"
[rp:years-old] -- "about 30 years old"
ElvUI Config -> Profiles -> Import -> and paste in the messy text. Boom! You get a new demo UI to play with. We Need Our Giant Face Pictures UIs! Speaking of ElvUI, go to ElvUI Config -> [rp:tags] and there's a single checkbox that will let you break the normal limits on ElvUI's unit frames, at least the player and target frames. This way you can have a giant face that takes up half your screen. The latest version of this addon is 0.850 and was uploaded on Feb 12, 2019 at 01:22. This file was last downloaded on Apr 21, 2019 at 23:02 and has been downloaded 2033 times. Good question, I'll see what I can do. I guess one could actually push this even further if it would be possible to make the "first glance"-Text accessable by the datatext panels. Do you know if that would be a possibility? I just think it could be quite usefull if one could display them as Datatext infos and on mosover display the contents. I dont know however in how far Datatexts can access info that relies on target (distance seem to work atleast). Would be great to get rid of the TRP-Frame in ELVUI and simply map these infos in shortened Datatexts that could be dormant/hidden when OOC/no PC or so. While still being a fixed part of the UI style and design. Buran, good idea. I will work on that soon. I would love to see a tag for a player's guild name, which would return nothing for non-player units or players not in a guild. This would make it easy to add guild names to unitframes, which is something not currently offered by ElvUI. Hi, Eshja, I'll see what I can do about putting the code up. I see you on Discord, did the code work? I am not great at discord so I may need to generate a new invite code. Hello! Thanks for creating this addon. Frames you showed in screenshots are awesome, could you share code of this ui maybe? Ps. Discord invite doesn't work. Cryptexx, apologies. TRP3 changed some code that caused mine to break, and so I didn't get around to fixing it until just now.